Sugammadex is a synthetic cyclodextrin derivative that encapsulates aminosteroid muscle relaxants, especially rocuronium, to reverse their effect. Sugammadex (Bridion®, Merck Sharp & Dohme B.V., a subsidiary of Merck & Co., Inc.) was first released in the European Union in 2008 and then in Japan in April 2010. Sugammadex has been widely used since its release in Japan. Total sales of sugammadex in Japan reached $51,880,000 in 2010, more than four times that in Spain ($11,376,000), which was second in sales worldwide (data obtained from MSD K.K. (a subsidiary of Merck & Co., Inc.).1 Sugammadex use in Japan has continued to grow with a total of 11,053,680 vials sold over the seven years since its release (© 2018 IQVIA/IMS-JPN (Japan) JPM (Japan Pharmaceutical Market), calculation based on JPM from April 2010 to June 2017 (reprinted with permission). It is not possible to accurately count the number of patients who have received sugammadex because multiple vials may be used on a single patient. Assuming that only one vial was used in most cases, sugammadex was administered to approximately 10% of the total Japanese population during the eight-year period since its release. Atvagoreverse® (a mixture of neostigmine and atropine) was used to reverse the effects of muscle relaxants in Japan before the release of sugammadex. The incidence of neostigmine is not exactly elucidated in the literature. However, there are only a few isolated case reports despite decades of its routine use to reverse neuromuscular blockade. While a dose of Atvagoreverse® (6 ml) costs about $6 US Dollars, a 200 mg dose of sugammadex costs about $90. Despite this enormous difference in price, sugammadex has rapidly become popular due to its reliability in reversing the effects of aminosteroid muscle relaxants. Other contributing factors for its wide use in Japan include unique features of Japan’s nationwide health insurance system that substantially reduces the patient’s financial burden and the aggressive promotion by the local pharmaceutical company. Consequently, many Japanese anesthesia professionals are unlikely to consider price when they select drugs to use during anesthesia. There have been several reports on anaphylaxis caused by sugammadex in Japan.1-4 According to the adverse events database of the Japanese Pharmaceuticals and Medical Devices Agency (PMDA—an agency similar to the Food and Drug Administration that handles pharmaceuticals and medical devices), 284 cases of sugammadex-induced anaphylaxis were reported between April 2010 and June 2017. Of these cases, 268 cases were reported by MSD, while the remaining 16 cases were reported directly by medical institutions. In accordance with government regulations, all the cases reported by MSD were critical, while the cases reported directly by medical institutions included noncritical cases. Of the total 284 cases, there were 157 cases reported as anaphylactic shock, 88 cases reported as an anaphylactic reaction, 4 cases reported as anaphylactoid shock, and 35 cases as an anaphylactoid reaction. The variety of names used to describe allergic reactions in the reports are likely due to variations in the definition of anaphylaxis in Japan. In the past, allergic events involving IgE were called anaphylaxis, while those not involving IgE were called anaphylactoid reactions. The use of the term “anaphylactoid reaction” is no longer recommended.5 Based on the number of PMDA reported cases and total number of doses sold, the incidence of sugammadex-induced anaphylaxis is estimated to be approximately 1 in 40,000 cases (0.0025%). According to data from the Japanese Society of Anesthesiologists (JSA) reported in June 2013 (based on reports from MSD), 95 cases of sugammadex-induced anaphylaxis (no mortality) occurred from April 2010 to October 2013.6 Based on the number of patients who were estimated to have received sugammadex during the survey period (3.09 million patients), the incidence of sugammadex-induced anaphylaxis was calculated to be approximately 29 for every 1 million administrations (1:34,483, 0.0029%).6 This estimate is close to the number obtained from the PMDA database (Figure 1). This similarity in the PMDA and JSA estimates is not unexpected since the data used were largely based on the same source, i.e., reports from MSD. However, it is unclear whether the incidence of sugammadex-induced anaphylaxis can be accurately estimated from these data because it is unlikely these reports capture all cases of anaphylaxis. In a recent Japanese single-center study, six cases of anaphylaxis were suspected to be caused by sugammadex during a three-year study period. This study estimated the incidence of sugammadex-induced anaphylaxis to be approximately 1 in 2,500 cases (0.039%) based on a study population of 15,479 patients.7 The authors of this Japanese study referred to a previous observational study reported from two institutions in New Zealand, showing that the estimated incidence of anaphylaxis due to succinylcholine and rocuronium was 0.048% and 0.04%, respectively.8 The authors of the former study concluded that the incidence of sugammadex-induced anaphylaxis is roughly equivalent to that of succinylcholine- and rocuronium-induced anaphylaxis (Figure 1).7 It is important to note that the incidence of sugammadex-induced anaphylaxis was approximately 13 times higher than that reported by PMDA and JSA studies. Of the 95 cases of anaphylaxis reported by the JSA, 76 cases clearly showed an onset time for sugammadex-induced anaphylaxis. The JSA study suggested that the onset of sugammadex-induced anaphylaxis occurred within five to ten minutes after administration in 50 (65.8%) and 66 (86.8%) cases, respectively, among a total of 76 cases of sugammadex-induced anaphylaxis, who had a confirmed onset time.6 This is in contrast to a recent review of sugammadex-induced anaphylaxis which reported that the slowest onset was four minutes and the mean value was approximately two minutes after the administration of sugammadex.9 Sugammadex is often administered after the end of surgery before extubation, but sugammadex-induced anaphylaxis may occur after extubation. Reported symptoms of sugammadex-induced anaphylaxis are commonly respiratory system-related, including edema of the airway and bronchospasm. Decreases in arterial oxygen saturation are reported in about half of the cases of sugammadex-induced anaphylaxis.9 When severe respiratory symptoms appear after extubation, reintubation or other supportive treatment may be necessary. If the discovery of the symptoms is delayed, the patient’s life may be at a severe risk. In facilities that transfer patients to the PACU, ICU, or other wards immediately after extubation, there may be a period when patients are not monitored closely, which could delay diagnosis and treatment.6 Therefore, patients who are administered sugammadex should be observed carefully in the operating room for at least five minutes after administration. In addition, they should be monitored closely during transport. The total percentage exceeds 100%, because a patient with multiple causative agents was included. A definitive diagnosis of anaphylaxis must satisfy the following conditions: presence of the clinical diagnostic criteria of anaphylaxis, high blood levels of histamine and/or tryptase, and a positive reaction to the culprit drug with skin testing.10 The authors of this article performed skin tests on 22 patients with perioperative anaphylaxis at Gunma University Hospital and nearby medical institutions to determine the causative agents during the four years from May 2012 to March 2016. A causative agent for the perioperative anaphylaxis was identified in 20 out of 22 cases. 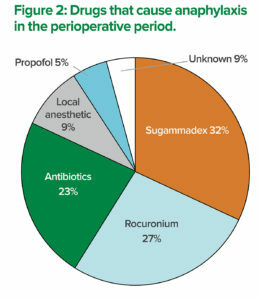 The top three causative agents of perioperative anaphylaxis were sugammadex in eight patients (32%), rocuronium in six patients (27%), and antibiotics in five patients (23%) (Figure 2). The incidence of anaphylaxis due to each drug within our institutions is unknown because we did not track the total number of patients who received those drugs. However, it is true that sugammadex was the most common causative agent of perioperative anaphylaxis in our study. We presented these results at the 2016 63rd annual meeting of the JSA in Fukuoka, Japan. In a recently published study of potential sugammadex-induced anaphylaxis at a single center in Japan by Miyazaki et al., elevated plasma tryptase levels were observed in only one out of the six patients studied while the diagnosis of sugammadex-induced anaphylaxis was based on the timing of the appearance of clinical symptoms.7 Although the skin testing is the gold standard for identifying the causative agent of anaphylaxis, it has some disadvantages. Skin testing may induce the recurrence of anaphylaxis, although the possibility is low. In addition, patients can experience pain during the skin testing. Specific IgE measurement is an alternative in-vitro method for allergy testing but requires a blood sample, and detection of sugammadex-specific IgE has not been reported. Recently, it has been suggested that the basophil activation test can be used for diagnosing sugammadex-induced anaphylaxis.11 As with anaphylaxis caused by other drugs, performing multiple tests is necessary to increase accuracy in the diagnosis of sugammadex-induced anaphylaxis. 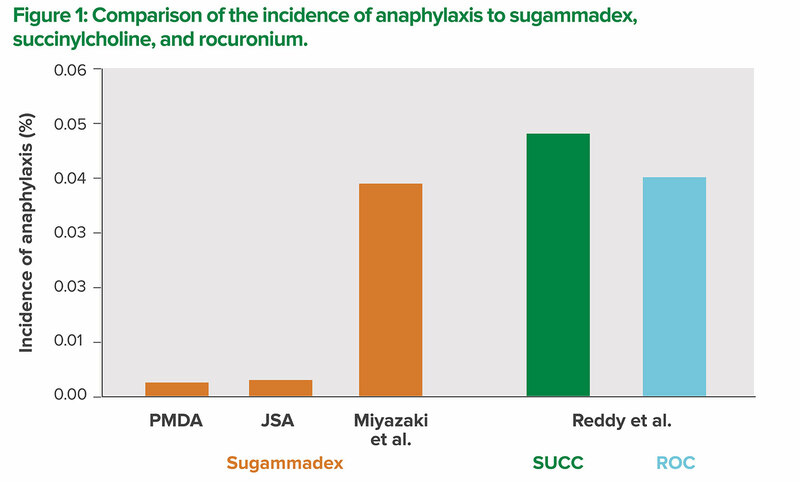 We have presented data that were reported by the PMDA, JSA, and data from Miyazaki et al., regarding the incidence of sugammadex-induced anaphylaxis. Given the variability in the reported incidences of sugammadex-induced anaphylaxis between studies, and the lack of a true denominator containing the number of sugammadex doses administered, a precise estimate of the incidence cannot be ascertained at this time. Since the reports by the PMDA and JSA used a framework in which physicians voluntarily reported cases of anaphylaxis, it is unlikely that these reports captured all cases of anaphylaxis resulting in underestimation. In contrast, the study by Miyazaki et al. is limited by small numbers, practice at a single institution, and insufficient testing. Although JSA annually asks member facilities to submit an incidence report of “accident cases” (cases where complications occurred but could not be forseen by anesthesia professionals), the primary objective of their report was not to estimate the incidence of anaphylaxis due to individual drugs. Thus, further studies are needed to determine the incidence of sugammadex-induced anaphylaxis in Japan and worldwide. Sugammadex has rapidly gained popularity in Japan probably because many anesthesia professionals have been convinced of its effectiveness. However, in order to use sugammadex safely, anesthesia professionals should remain aware of the possibility of anaphylaxis and observe the patients diligently for at least five minutes after administration. Dr. Takazawa is an Assistant Professor in the Intensive Care Unit at the Gunma University Hospital, Gunma, Japan. Dr. Miyasaka is a Professor in the Department of Perianesthesia Nursing at the St. Luke’s International University, Tokyo, Japan. Dr. Sawa is a Professor in the Department of Anesthesia at the Teikyo University, Teikyo, Japan. Dr. Iida is a Professor and Chair in the Department of Anesthesiology and Pain Medicine at the Gifu University Graduate School of Medicine, Gifu, Japan. All authors are members of the Safety Committee of the Japanese Society of Anesthesiologists. The authors have no further disclosures as they pertain to the present article. Takazawa T, Tomita Y, Yoshida N, et al. Three suspected cases of sugammadex-induced anaphylactic shock. BMC Anesthesiol 2014;14:92. Godai K, Hasegawa-Moriyama M, Kuniyoshi T, et al. Three cases of suspected sugammadex-induced hypersensitivity reactions. 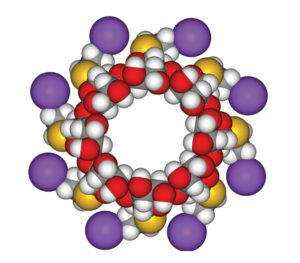 Br J Anaesth 2012;109:216–8. Obara S, Kurosawa S, Honda J, et al. Cardiac arrest following anaphylaxis induced by sugammadex in a regional hospital. J Clin Anesth 2017;44:62–3. Nakanishi T, Ishida K, Utada K, et al. Anaphylaxis to sugammadex diagnosed by skin prick testing using both sugammadex and a sugammadex-rocuronium mixture. Anaesth Intensive Care 2016;44:122–4. Johansson SG, Bieber T, Dahl R, et al. Revised nomenclature for allergy for global use: Report of the Nomenclature Review Committee of the World Allergy Organization, October 2003. J Allergy Clin Immunol 2004;113:832–6. Takazawa T, Mitsuhata H, Mertes PM. Sugammadex and rocuronium-induced anaphylaxis. J Anesth 2016;30:290–7. Reddy JI, Cooke PJ, van Schalkwyk JM, et al. Anaphylaxis is more common with rocuronium and succinylcholine than with atracurium. Anesthesiology 2015;122:39–45. Tsur A, Kalansky A. Hypersensitivity associated with sugammadex administration: a systematic review. Anaesthesia 2014;69:1251–7. Dewachter P, Mouton-Faivre C, Emala CW. Anaphylaxis and anesthesia: controversies and new insights. Anesthesiology 2009;111:1141–50. Takazawa T, Horiuchi T, Yoshida N, et al. Flow cytometric investigation of sugammadex-induced anaphylaxis. Br J Anaesth 2015;114:858–9.